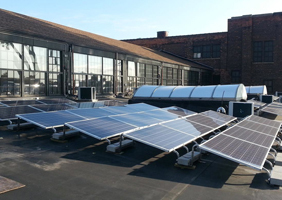 Srinergy has solar project development experience in a variety of industries and marketsincluding commercial properties, non-profit organizations, municipalities, restaurants, retail establishments, urban farms, universities and colleges. For standardized commercial applications, Srinergy offers predefined commercial kits, which in many instances, offers the perfect solution for our customers. In instances where a unique system size or application is required, Srinergy works closely with commercial customers on initial site assessment and system sizing through design, engineering, permitting and installation. Whether flat roof mounted solar or more creative applications, Srinergy works hand in hand with the customer to provide aesthetically pleasing designs, bringing maximum solar energy generation and costs savings to the table.